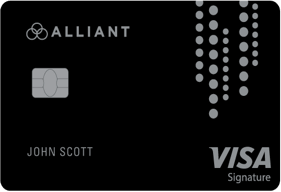 All Alliant Visa® cards come equipped with EMV chip technology to keep your finances safe and secure. Earn two rewards points for every dollar you spend. In search of cash back? Never pay foreign transaction fees when traveling,3 plus get emergency card replacement, emergency cash disbursement and travel accident insurance. Earn 3% cash back for the first year and 2.5% each year after. Alliant is one of the largest credit unions in the U.S., with nearly 400,000 members nationwide. We're just like a bank, but with better rates and more helpful customer service—it's why money-savvy folks choose us as their financial partner. Because we are not-for-profit, we can reinvest our profits back into our members. That's how we can offer such low loan rates and high savings rates! APR = Annual Percentage Rate. Loan approval and APR based on creditworthiness, payment method and ability to repay. Rates, terms, and conditions are subject to change. The Annual Percentage Rate may vary after the account is opened. Refer to the Alliant Credit Union Visa Credit Disclosure for more information. The introductory rate on purchases and balance transfers is good for 12 billing cycles from the date that your new Alliant Credit Union Visa Platinum credit card is opened. After the 12th billing cycle, your APR will adjust to your standard variable rate, which will apply to all new purchases and new balance transfers and all unpaid purchase and balance transfer balances remaining from the introductory period. The Annual Percentage Rate may vary after the account is opened. Refer to the Alliant Credit Union Visa Credit Card Disclosure for more information. After the introductory period, any remaining unpaid balances and new transactions will be at your low variable rate. You will have no less than a 25-day grace period on new purchases and balance transfers posted to your account during a billing cycle. Such transactions will not incur a finance charge for that billing cycle if you had a zero or credit balance at the beginning of that billing cycle or you paid the entire New Balance on the previous cycle's billing statement by the Payment Due Date of that statement; otherwise, a finance charge will accrue from the date a purchase or balance transfer is posted to your account. To avoid an additional finance charge on the balance of purchases and balance transfers, you must pay the entire New Balance on the billing statement by the Payment Due Date of that statement or 25 days from the statement closing date listed on that statement, whichever is longer, or you may lose the grace period on new purchases. Refer to the Alliant Credit Union Visa Credit Card Disclosure for more information. Balance transfers must be transferred from a financial institution other than Alliant Credit Union. Balance transfers and cash advances may not be used to pay any Alliant accounts. Amounts transferred are subject to your available credit limit. We are not required to honor a balance transfer request that will cause you to exceed your available credit limit. We will not be responsible for late payment or non-payment to other card issuers. We are not responsible for fees that may be charged for cash advances performed at other financial institutions and ATM owners. It may take up to three weeks to set up the new Alliant Credit Union Visa credit card account and/or to post the balance transfer transaction. You should continue to make all required payments until you confirm that the balance transfer was made. We will not close your other accounts even if you transfer the entire balance. If you wish to close another account, you should contact the issuer directly. Refer to the Alliant Credit Union Visa Credit Card Disclosure for more information. The balance transfer fee is 2% of the amount of the balance transfer but not less than $5. The cash advance fee is 3% of the amount of the advance, but not less than $10. We will begin charging interest on cash advances on the transaction date. The foreign transaction fee is 2% of each transaction where the merchant country differs from the country of the card issuer. The minimum payment required is 3% of your balance or $25, whichever is greater, plus the amount of any prior minimum payments that you have not made. Refer to the Alliant Credit Union Visa Credit Card Disclosure for more information. APR = Annual Percentage Rate. Loan approval and APR based on creditworthiness, payment method and ability to repay. Rates, terms, and conditions are subject to change. The Annual Percentage Rate may vary after the account is opened. Refer to the Alliant Credit Union Visa Credit Card Disclosure for more information. 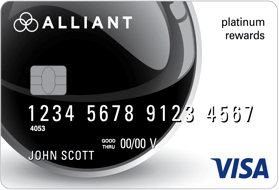 To earn the 5,000 bonus Alliant Rewards points, new cardholder must spend $500 or more in qualifying purchases on his/her Alliant Credit Union Platinum Rewards Visa credit card during the first 90 days the account is opened. Points will be awarded and posted to the account, if applicable, at the close of the next billing cycle after the $500 spend threshold is met. Introductory rate and incentive offers, including bonus points, are available only to members whose accounts are in good standing, and not available to those who in the previous six months have had (I)an open Alliant Visa credit card account, or (II) an outstanding balance on a closed Alliant Visa credit card account. As described in the Alliant Visa Platinum Rewards Program Terms & Conditions, certain categories of purchases such as cash advances and gift cards do not qualify to earn reward points. See disclosures for additional details. Reward point earnings on qualified purchases are unlimited. APR = Annual Percentage Rate. Loan approval and APR based on creditworthiness, payment method and ability to repay. Rates, terms, and conditions are subject to change. The Annual Percentage Rate may vary after the account is opened. Refer to the Alliant Cashback Visa® Signature Card Disclosure for more information. The Annual Fee is $99 and is waived the first year. The fee will be charged to your card annually on the 3rd business day of the month following your anniversary date. You will incur the annual fee even if you don't have a balance. Minimum interest charge is $1.00. Foreign Transaction Fee - None. Cash advance fee - 3% of the amount of the advance, but not less than $10. Balance Transfer Fee - 3% of the amount transferred. The minimum payment required is 3% of your balance or $25, whichever is greater, plus the amount of any prior minimum payments that you have not made. Refer to the Alliant Cashback Visa® Signature Card Disclosure for more information. As described in the Alliant Cashback Visa Signature Card Program Terms & Conditions, certain categories of purchases such as cash advances and gift cards do not qualify to earn cash back. 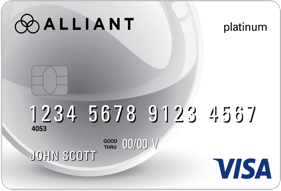 See the Alliant Cashback Visa Signature Card Disclosure for additional details. Cash back earnings on qualified purchases are unlimited.